This set, including Carafe and Glass, is the work of a Japanese family-owned business that’s been producing glassware for generations. 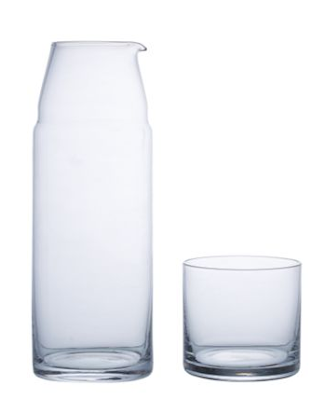 Made of blown glass, the Carafe has a spout for easy pouring and the Glass serves as a lid when stored on top of the Carafe. The Night Carafe may be intended for the bedside table, but its elegant presentation and functional design make it just as suitable for your office, study or dining area. Stands 7.5" tall and holds up to 15oz of liquid. A selection of essential house design objects!